"'There are a lot of limitations for working women everywhere in the world but especially in Afghanistan, where there are cultural restrictions,' she says. 'The only thing I have learned from the limitations of women in our society, is that if we have a goal and have self-confidence, we can get things done and fight those limitations...' She believes that one of the key steps in battling those confines is education." The women of Afghanistan are strong and ready to work on improving their communities. 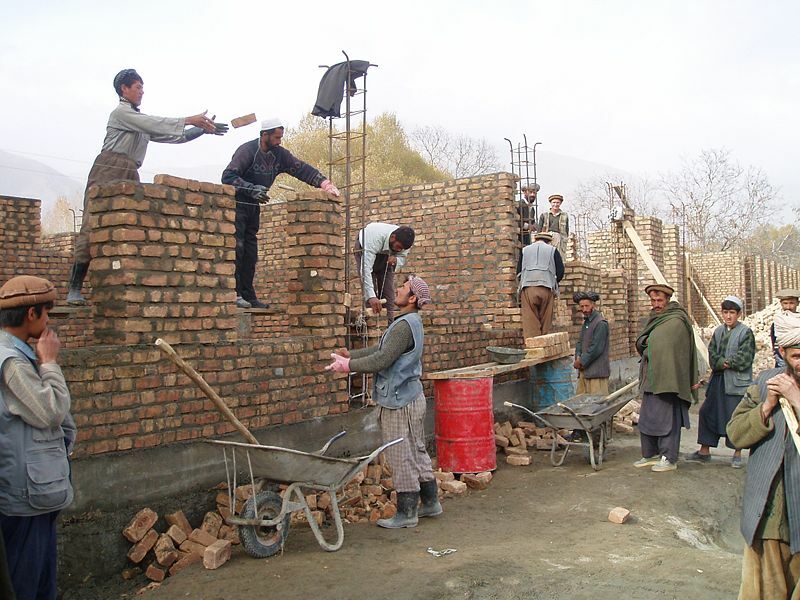 Photo of Afghans building school in Herat, courtesy of the US Agency for International Development and Wikimedia Commons. Afghanistan's future is being transferred to Afghan hands. Still, the chilling report describes a withdrawal picking up pace. The costs are heavy for villages that assist the Taliban, so often a decision that's made by a few. Rosenberg describing the use of explosive devices to knock down stands of trees and level a hill, either of which could provide cover for Taliban forces that want to assume control after the coalition forces leave. Happiness hinges on satisfaction with our achievements, which in turn can hinge on levels of health care, education and income. We live in an era when personal and collective achievements are obvious, and comparisons in our community, in the entire world, are easily made. "In particular, the very strong international relationship between per capita GDP and life satisfaction suggests that, on average, people have a good idea of how income, or the lack of it, affects their lives. It is simply not true that the people of India are as satisfi ed with their lives as the people of France, let alone Denmark, nor is it true that people in sub- Saharan Africa, or Afghanistan, Iraq, or Cambodia, are as happy as people in India." "People may adapt to misery and hardship, and cease to see it for what it is. They do not necessarily perceive their lack of freedom as a problem; the child who is potentially a great musician but never has a chance to find out will not express her lack of satisfaction, and whole groups can be taught that their poor health, or their lack of political participation, are natural or even desirable aspects of a good world." The analysis for the aging report is based on the Gallup World Poll, which collected data from samples of people in each of 132 countries during 2006. In Fear of Beauty, the main character, an Afghan woman living in a remote village, insists to a US aid worker that she is free and happy, and we'd like to think she feels the same a few decades from now. 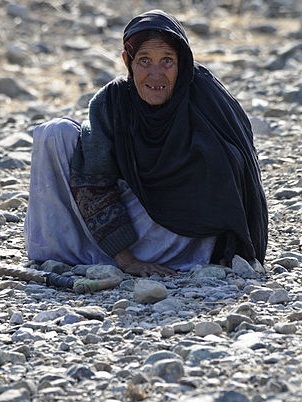 Photo courtesy of U.S. Air Force Senior Airman Adam Grant and Wikimedia Commons, which explains "An elderly Afghan woman looks on as members of Kunar Provincial Reconstruction Team perform a quality assurance check on the Zagrando Bando School Jan. 8 . The completion of this project will help provide a safe and sanitary environment that is conducive to learning and by improving the literacy rate in the area by a projected 25 percent." 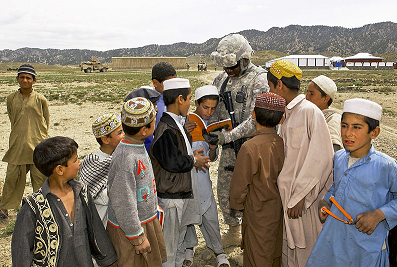 One doesn't hear much about the PRTs - the provincial reconstruction teams scattered throughout Afghanistan, providing education, technical advice and resources for agricultural and other endeavors. As the United States and other country withdraw troops from Afghanistan, the teams are heading home, too, but not before cutting ribbons on projects intended to help Afghan people into the future. A PRT team and Farah City officials celebrated the completion of a demonstration greenhouse project - "intended to connect Farahi farmers with new and innovative techniques to improve crop yields and profit margins," reports Lt. j.g. Matthew Strong for DVIDS, Defense Video & Imagery Distribution System. The greenhouse was a joint venture of the PRT; Abdul Manan Matin, head of the Farah Directorate of Agriculture, Irrigation and Livestock; and US AID. The organizers hope the greenhouse as a model for farmers to use in building their own facilities and develop Afghan agribusiness. Strong quotes Matin in his article: "I want this facility to be like a home for Farahi farmers... a place where farmers can come to learn new techniques that help them make more money and support their families." 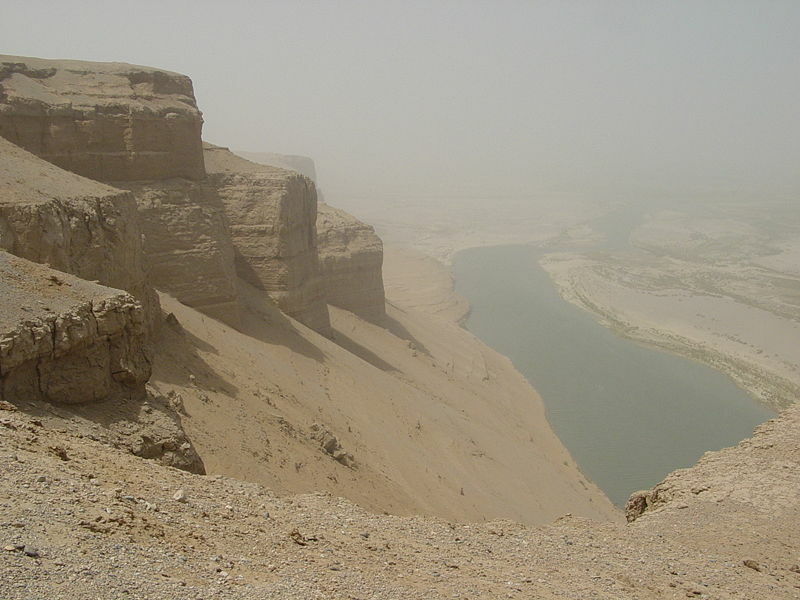 Fear of Beauty focuses on an PRT agricultural team working from an outpost in northern Helmand Province.